What is Matar Kulcha Recipe? 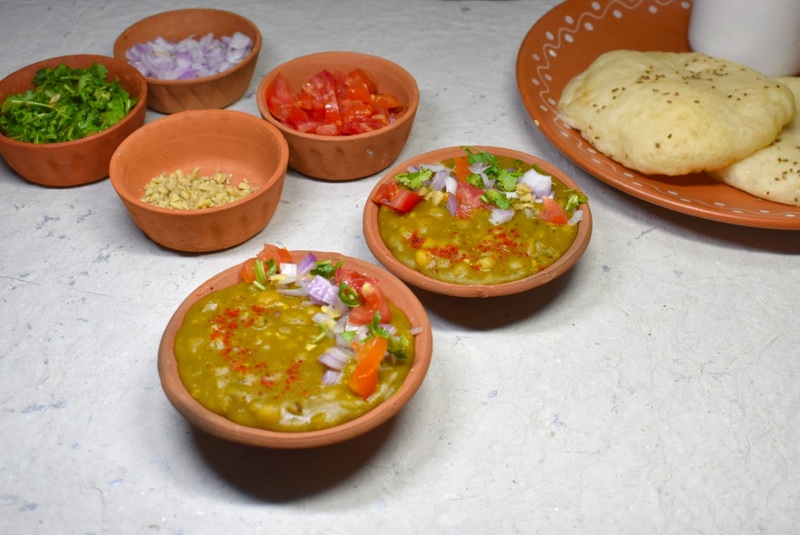 Matar is a tangy and spicy gravy preparation of white peas which is served with a flatbread called kulcha. Matar is flavoured with a jaljeera chutney that makes it so delicious. Matar or matra is a fuss free recipe. The cooking and preparation time is not much. You can serve Matar with readymade kulcha or homemade kulcha. Matar or matra is basically dried white peas easily available at the grocery stores in India (atleast)! It is very important to soak white for enough time and cook it till it is soft. At times white peas give a tough time, just add a pinch of baking soda while pressure cooking to ensure matar gets cooked properly. Take 1 and 1/4 cup dried white peas. Wash properly and soak for 7-8 hours or overnight. Pressure cook soaked matar with salt to taste and 3 cups water. Check matar should be soft. Transfer cooked peas in a vessel. Check the consistency. Add water as required. Mix well and simmer for 1-2 minutes. Add 1/4 cup water or as required. Grind to make smooth paste. Add 1/2 tsp cumin seeds and let it crackle. Now add 1-inch grated ginger and sauté it for 1 minute. Add 1 tsp chaat masala, 1/4 tsp garam masala, 1/2 tsp dry mango powder, 1 tsp red chili powder and 1/2 tsp roasted cumin seeds powder. Add spices to boiled peas. For 3-4 minutes on low medium gas flame. Check the consistency and seasoning. Transfer Matar in a serving bowl. Garnish it with chopped onion, tomato and coriander leaves, grated ginger and lemon juice. Sprinkle 1 pinch red chili powder. Bon Appétit Serve Matar with Kulcha.